Saturday, Sept. 22 the world celebrates Car Free Day! Each year, this day encourages everyone to get around without relying on a car. Not only can you save money by choosing an alternative to driving, you can also help make the world a cleaner place! According to Money Crashers, going car free is also great for your health and reducing your carbon footprint. Enjoy today by lowering your stress from sitting in traffic and giving up one of our biggest daily contributors of pollution. Hop on one of our buses or the A-train to enjoy your day! We provide many transportation options around Highland Village, Lewisville and Denton, and our A-train can connect you to Dallas and beyond! DCTA is a great alternative to taking your car to wherever you’re going. You can start a new book or catch up on some work or school work and let us take care of getting you to your destination! Schedule your trip today using our online trip planner at RideDCTA.net. Another great way to celebrate World Car Free Day is by riding a bike! According to a study, biking can actually be faster than driving a car if you’re going shorter distances. Not only is biking more environmentally friendly than driving a car, it’s also cheaper because you don’t have to pay for gas! Most DCTA buses are also equipped with bike racks on the front, so you can take advantage of two alternatives at once on Car Free Day! Now that we’re heading into fall and the temperatures are dropping, try one of the most environmentally-friendly options – taking a walk! If where you’re going is within walking distance, take your dog or your friend and enjoy the weather before it starts getting cold! Our A-train Rail Trail is the perfect way to enjoy the day and the outdoors! If you can’t get to your destination without driving, try to share a ride! Carpooling helps reduce costs of driving (you don’t have to pay for parking multiple times!) and helps reduce pollution and traffic. According to The Eco Guide, if everyone in the U.S. chose to carpool just one day a week, traffic could be reduced by as much as 20 percent! We offer a commuter vanpool option that offers groups of six to 15 people a cost-effective way to get to work together! The North Central Texas Council of Governments’ (NCTCOG) Try Parking It program will even give you points for biking, walking and carpooling which you can redeem for prizes! If you’re heading out solo on World Car Free Day and still need a car, ride sharing is another option! Mobile apps like Lyft and Uber give an option to carpool and let you take advantage of not having to drive yourself. In Highland Village, DCTA partnered with Lyft to give discounted rides through the ride sharing app, so if you still need to get somewhere, you can go without your car! 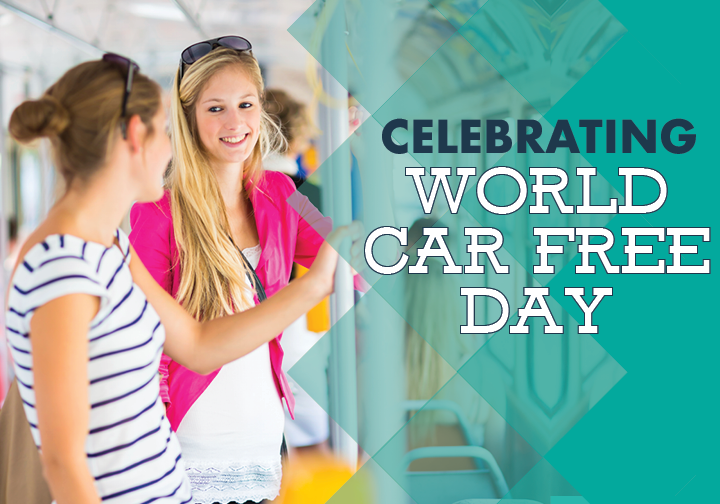 Tell us in the comments below where you plan on going without your car on World Car Free Day!